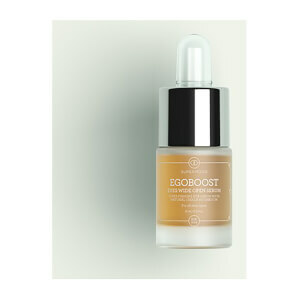 This wonderful serum is a mixture of fruits extracts, firming Moth bean and light reflecting ingredients that give the skin beautiful, subtle glow. This serum is full of vitamins like A, C and E. It’s a perfect product to use under the make-up, or it can be used alone on bare skin, to lighten up the day. For best results use on the top of the Radiance oil. Aqua (Water), Glycerin, Simmondsia Chinensis (Jojoba) Seed Oil, C14-22 Alcohol, C12-20 Alkyl Glucoside, Hippophae Rhamnoides (Seabuckthorn) fruit Juice, Rosa Canina (Rosehip) Seed Extract, Cucurbita Pepo (Pumpkin) Seed Oil, Argania Spinosa (Argan) Kernel Oil, Ficus Carica (Fig) fruit Extract, Pyrus Malus (Apple) fruit Extract, Citrus Grandis (Grapefruit) fruit Extract, Parfum, Geraniol, Limonene, Linalool, Mica, CI 77891 (Titanium Dioxide), Silica, Calendula Officinalis (Marigold) flower Extract, Butyrospermum Parkii (Shea) Butter, Sodium Dehydroacetate, Xanthan Gum, Vigna Aconitifolia Seed Extract, Maltodextrin, Tocopherol, Sodium Benzoate, Citric Acid, Hydrolyzed Hyaluronic Acid, Lactic Acid.